Ian Wright rightfully rewarded Ross Barkley for his performance against the Czech Republic in England's European Championship qualifier. Gareth Southgate's side crushed the Czechs in a 5-0 demolition that had the Wembley crowd purring in delight. Raheem Sterling snatched his first international hat-trick, captain Harry Kane scored from the spot before on-loan Chelsea player Tomas Kalas's calamitous own goal sealed a victory full of flair and excitement. Ross Barkley was brought on sooner than expected, following Eric Dier's withdrawal through injury and the Blue's midfielder made the most of his 64 minutes. Nobody wishes injury upon a player, yet Barkley's introduction brought England to life which was lacking whilst Dier was on the field. He added more dynamism going forward, constantly looking to link play with his attacking teammates. It was his powerful drive from deep inside his own half that produced Sterling's third goal. 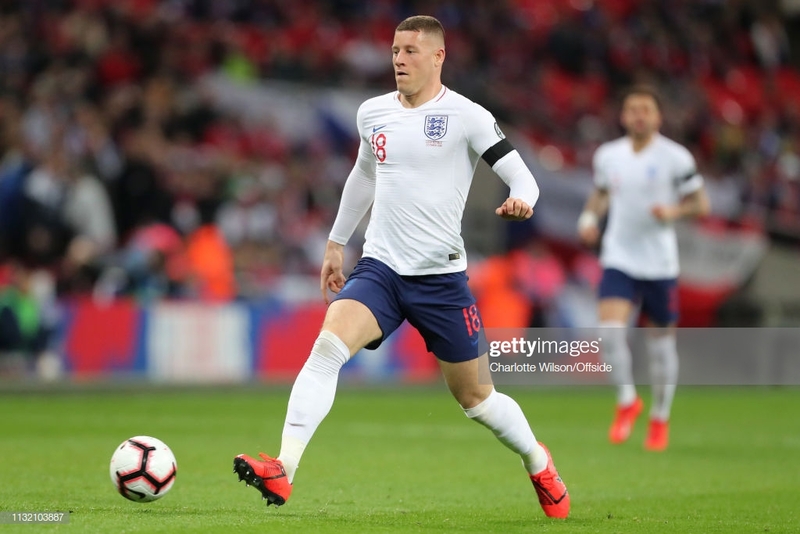 Ian Wright, once of Arsenal and England, was full of admiration for Barkley's role, saying on ITV after the match, "I thought Barkley was quite effective when he came on, he ran with the ball. He gave us [England] thrust, which was good for us." "Great touches again today. Got on the ball and he was attacking, running with it, making things happen. He was very good and made the difference." Only Jadon Sancho delivered more key passes than Barkley on the evening (Sancho four, Barkley three) and his assist for Sterling was the highlight Chelsea and England will hope to witness more often. It is now confirmed that Dier will miss the Three Lions' next qualifying fixture against Montenegro due to the muscular problem that cut short his evening. This provides a golden opportunity for someone to step up to the mantel in midfield, Barkley boasting the best chance. It is no secret Southgate has a soft spot for the Chelsea man, playing him in every one of England's UEFA Nation League fixtures. As Mark Pougatch mentioned on ITV, "Barkley on for Dier gave them [England] a lot more momentum", which is just what the team require if they're to top Group A. He will, however, have competition from fellow Londoner, Declan Rice, who was handed his England debut against the Czech's. The West Ham youngster is more a defensive figure, whilst Barkley is more effective further afield; Southgate now has a healthy selection situation on his hands. Barkley now has 26 international caps, aiming to expand on that plus carry his formidable form with the national squad into his club career.